Satisfying your customers is crucial to the survival of your business. You need to provide them with what they need at the snap of a finger. At the same time, speed should not sacrifice quality or you will lose to the competition. When it comes to juicing, the same principals apply. 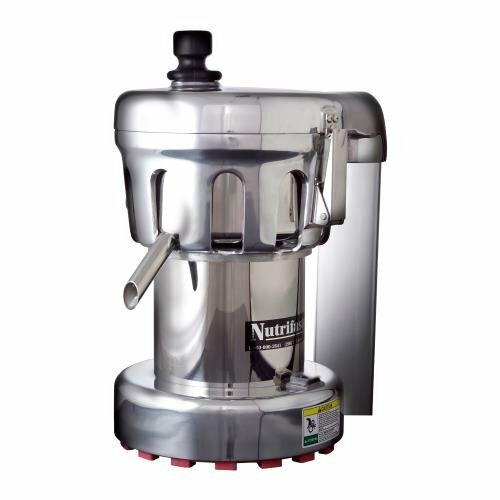 Whether you are operating a bar, a restaurant, a health club or anything that is in demand for quality fresh juice, you need a commercial juicer that will deliver, like the Nutrifaster N450. Some say it is the only juicer you will ever need. As a matter of fact, it is one of the most highly rated juicers available. But does the Nutrifaster N450 live up to the hype? The Nutrifaster N450 was designed to work in a commercial setting where there is a high demand for juice. You can tell by just looking at it that it was made to withstand heavy abuse. Although it can function all day, it is advisable to not let it run for more than 45 minutes continuously. You should try to give it a break of 15 minutes. As a machine meant for continuous juicing, it has no pulp container. There is a simple pulp tube that automatically releases pulp into a receptacle of your choice. This is a life saver since you will never have to stop juicing to get rid of the pulp. Another thing to note is that the juicer fails when it comes to leafy vegetables. If taken in context, this is no surprise as centrifugal juicers are notorious for their poor handling of leafy vegetables. You will need to get a masticating juicer if you plan on juicing these types of ingredients. As for speed, the Nutrifaster N450 does a good job. It can extract 5 ounces in roughly a minute like the manufacturer advertised. The stainless steel parts are a guarantee that the juicer will survive years of heavy use. It comes with a 12-month warranty. Although you would think this is not enough in regard to price, you should understand that this machine is meant to be used in a commercial environment. You can just imagine the number of people who would order juice on a daily basis. Many juicers competing with the Nutrifaster N450 have shorter warranties. This is fairly easy. The parts that need cleaning are not many (the juice pan, screen basket, cutter plate, blade nut, food pusher and the wrench). All these parts are dishwasher safe. You can also use “Clean Cut”. This is provided by Nutrifaster and it is for cleaning their juicers. You will find more instructions on how to use it in the user’s manual. Nutrifaster did not forget about the safety of the operator and the juicer itself. There is a safety latch that keeps the machine from operating if it is not properly secured. Additionally, the motor has overload protection that again keeps it off if there is too much weight on it. It also has overheat protection that turns the motor off after prolonged usage. If this happens, you should let the juicer cool down for at least 15 minutes. This juicer is not difficult to recommend. The probability that you will like it is high. Though it is ideally for a commercial environment, it would be just fine if you used it at home.